Last week, I went on a trip with my Mom and Aunt to Asheville, North Carolina. While there, we took a short drive to Black Mountain to visit the Swannanoa Valley Museum. This museum is located in the old Black Mountain Fire House. According to the museum website, the fire house was designed and built in 1921 by Richard Sharp Smith, supervising architect at the Biltmore Estate. There is no charge to go through the museum, and donations are gladly accepted. There are a lot of neat things to see, and there is a wealth of information about local families and their histories in the area. I enjoyed it very much and highly recommend it. "Memento Mori" is a Latin phrase that may be freely translated as "remember that you are mortal," and is a theme that threads throughout history and art, literature, and funeral customs. Mourning jewelry became popular after the death of Queen Victoria's beloved Prince Albert, and elaborate mourning rings, brooches, and other personal items were embellished with hair from the deceased loved one. Many were made of jet or onyx stones. This jewelry mirrored the lives and times of the people who wore it, a souvenir to remember a loved one, and a reminder to the living of the inevitability of death. 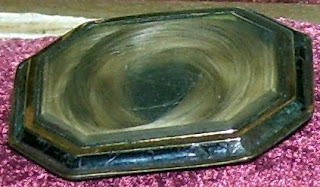 The mourning brooch displayed here was donated to the Swannanoa Valley Museum by Elizabeth Lynn." The collecting of mourning jewelry goes on today. A Google search will result in lots of links to visit and images to view if you are interested in learning more.